Authentic Ibizan finca, which retains its original shape adapted to modern tastes. 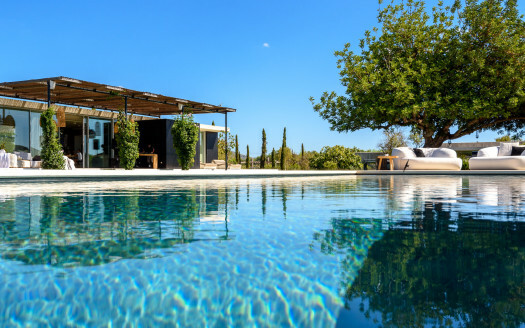 Due to its convenient location close to Ibiza, is ideal for those seeking tranquility and intimacy of a private villa without sacrificing the convenience of being within short driving distance from the city. The villa extends into three different areas including the bedrooms, pool and terraces and, finally, the garden. It’s the perfect place to enjoy the White Island. The house is air conditioned, but also due to the thickness of the walls, the finca retains a stable temperature throughout the summer. Access to the property through a path road in a perfect condition. Living room with fireplace, equipped with satellite TV, audio equipment, Wi-Fi. Large kitchen with dining area, fully equipped with dishwasher, refrigerator, oven, Nespresso. Access to outdoor patio and separate laundry with washer (+2) and dryer (*2). 1 Double bedroom with two single beds together. 2 Double bedrooms with double beds, each with private bathroom en suite with shower. Outside porch with summer lounge. 1 Independent apartment with living room with fireplace, small independent kitchen (gas), one double bedroom with two single beds and en suite bathroom with shower. Central porch with outside dining for 12 people. Chill-out area with two large loungers. Private 12×5 m. pool with Chlorine filtration system. Loungers and umbrellas for 12. Large barbecue with covered dining area. WiFi, International Sat TV, Alarm system, Audio equipment. 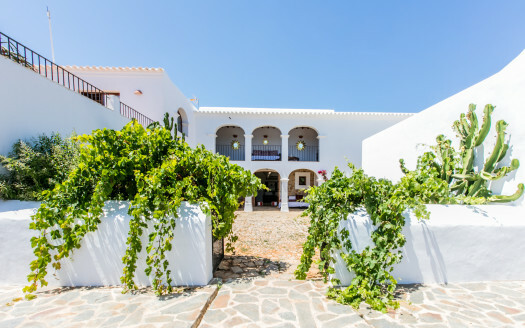 Located on a rural plot of 100,000 m2 on the road to San Mateo, just 2 km from the picturesque village of Santa Gertrudis, one of the most popular gathering places of the island and about 10 km from the city of Ibiza. Services incl: Cleaning Wednesday and Saturday, Final cleaning.